Year of the Realm....part 2? I used to refer to 1998 as "The Year of the Realm", and in fact that's the title of the 1998 section right here. While that was certainly a year of great learning for me as far as the ins and outs of computing, programming logic and at least 3 languages worth of syntax (if you count HTML as a language, LOL! ), this year trumps even that with one major breakthrough: SUCCESS. So many amazing things have happened since January 1st! On top of that, I've learned at least as much new stuff this year as I ever did in college, and more than in 1998 alone, which was a HUGE year for me. As I stated in the 2007 section, I took a new position for my "day job" as the IT Coordinator for 3 small companies owned by the same partnership. Technically, that has grown into 4 companies, but I digress. This position has given me key experience thus far in Windows Server/Active Directory administration, MS Exchange server administration, and even (gasp!) a territory I once found myself saying I'd never grasp or even have a chance to learn without forking over big $$: Cisco router programming! I've played with T1s, programmed a whole MS-SQL-based product output tracking program suite in Visual Basic 2008 (it uses real time data fed by ROBOTS! YEAH! ), and built MANY computers from scratch, something we didn't do at Cook (we bought everything from Dell there.) It's basically a dream position for me in a lot of ways, though it taught me that maybe I don't want to be the master of everything (which is hard on my perfectionist tendencies.) My only limit on gaining experience in this position is the amount of time I have to invest in doing more/learning more. About the only thing the position has done is burn me out on client support and training issues. Not too much fun just installing windows or installing printers or things like that...or trying to teach someone how to do something when they just don't seem to be able to grasp it. Not fun, but I make it through with pretty good success anyway. This year, I finally went the whole route with BRS...state registration, tax ID number, biz bank accounts, the works. This would have not been possible without one key project that started early in the spring/late winter, thanks, once more, to a good friend who has helped get the ball in my court more than once now. 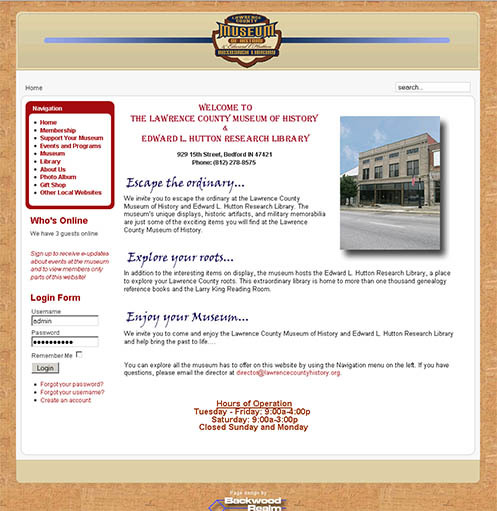 This project would be winning the bid for the "Lawrence County History Museum" website. This one project netted me enough money to launch BRS as it's own entity. It was a neat project to work on, and I have an ongoing maintenance contract for it through 2013! The site is based around a CMS, which I heavily modified. Was a great tool for learning more about PHP, MySQL and CSS. 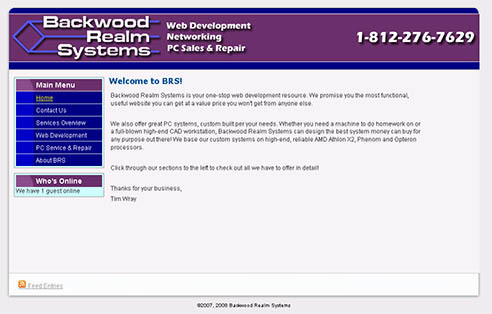 I also began a large amount of system repair and custom PC building under the BRS name. I built one system in particular based around a very cool Raidmax case that I named "The Z Box". I had plans on purchasing a large lot of these cases and selling these as a line of BRS computer systems, but the time I had to put into my "day job" and family time with our small children kept me from moving foward with this. 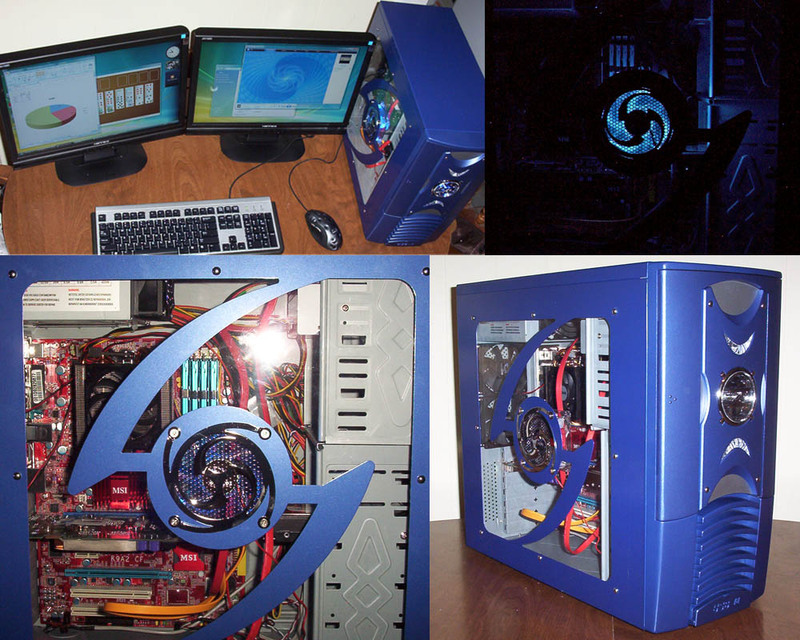 It was an impressive system in that I was able to build it with a top model AMD Phenom Black Series quad-core processor, 4GB of RAM, top end video card and dual 19" widescreen monitors...for around $1700 including a Windows Vista Business license. See if you can get a Dell XPS with those specs and 1 monitor for less than $2500. You can't. The Z-Box on 5/29/08, just before shipment. Only model built (thus far.) Click photo to enlarge for closer look! It's COOL! 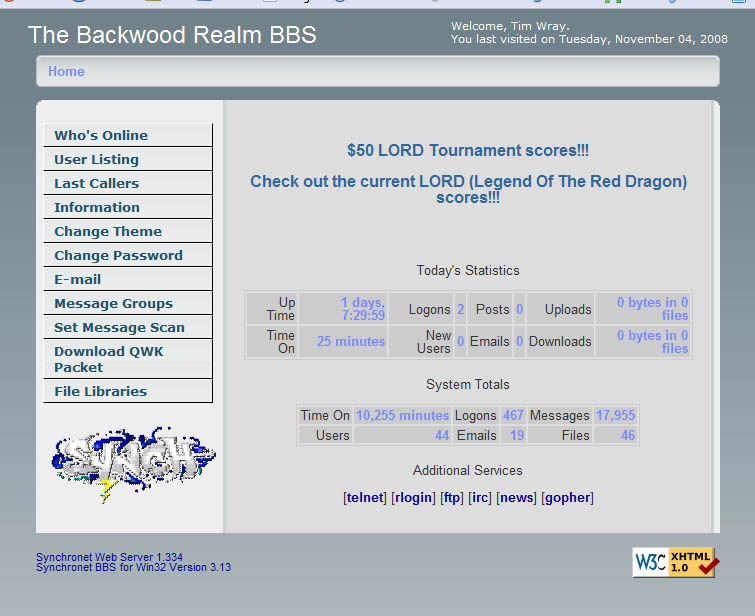 I rebuilt the Backwood Realm Systems website on the newest release of Joomla so I could use some of the v1.5 features. Still sticking with the traditional "Livin' In Buddha" (see 1998) color scheme as you can see :). I like to say I know my roots! I also purchased some large-area domain names for city/community websites for two Indiana cities with populations over 10,000 (Greensburg and Seymour, Indiana.) I have started development on a not-yet-finished website for the underserved online community in and around Seymour, but not the Greensburg site, just yet. Not sure what direction these sites will take, but I hope to make at least my investment back from them. "My Seymour Indiana" is expected to launch in the spring of 2009.
from 9/2008. Nowhere near complete here! By late summer, I found myself a bit burnt out on work, so I was looking for a way to bring back some excitement into computing. As I often do, I found myself looking backward. I decided to restart "The Backwood Realm BBS" after an almost decade-long hiatus. The Door games on there have been doing very well as of this writing, particularly "Legend Of The Red Dragon". A lot of the old BBSers that were around the Bedford BBS scene in the mid and late 90s have been logging in daily to play their day's game to try to beat everyone else's score out. Running the BBS has been a BLAST so far, and it's encouraged my creativity in coming up with ways to make things happen, causing me to write my first full fledged utility in many years. I wrote a VB .NET based program that converts old MS-DOS ANSI to HTML that has exact corresponding colors. I call it "ANSI2HTML", and so far, it's done quite well. I may expand it to handle more complex ANSI color schemes and the extended ASCII characters eventually. 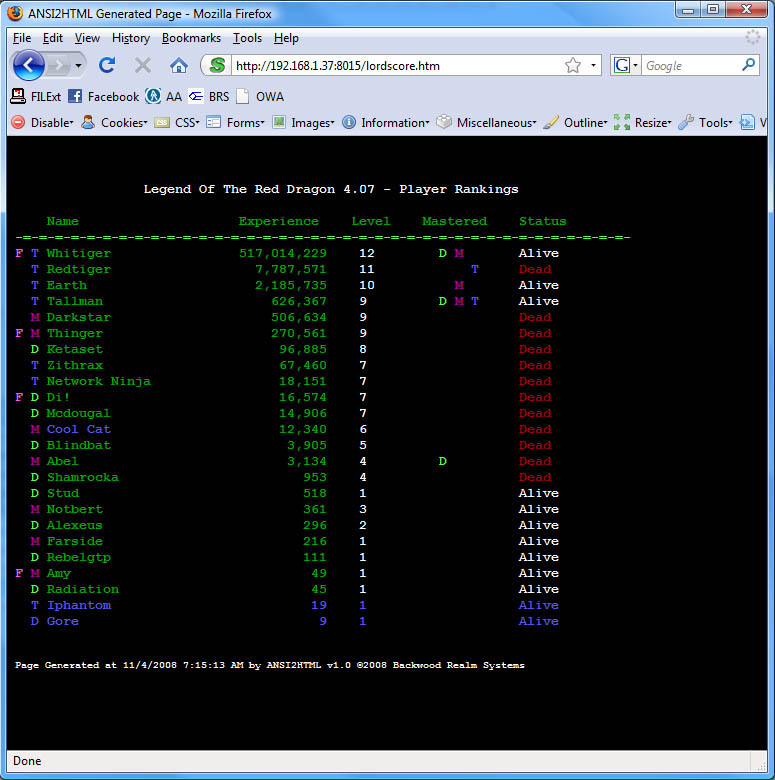 It's prime use is taking ANSI generated from the dial-up/telnet side of a BBS and converting it into useful HTML on the server side, so people can log in and check their progress in L.O.R.D. or things like that without having to go through the process of logging into the BBS completely. It's nice to have a piece of software that I wrote doing daily duty in some form, as it is on the BBS. Abel, my old buddy for many years, wrote an In-Game module for LORD II: NEW WORLD, called, quite interestingly, "Abel's Arsenal", the same name as his appearance in my game "Livin' In Buddha" that I wrote in 1998-1999. Synchronet up and running, with user Scott Miller running the LORD Door game. This is what the Sysop (myself) sees when a user logs on. 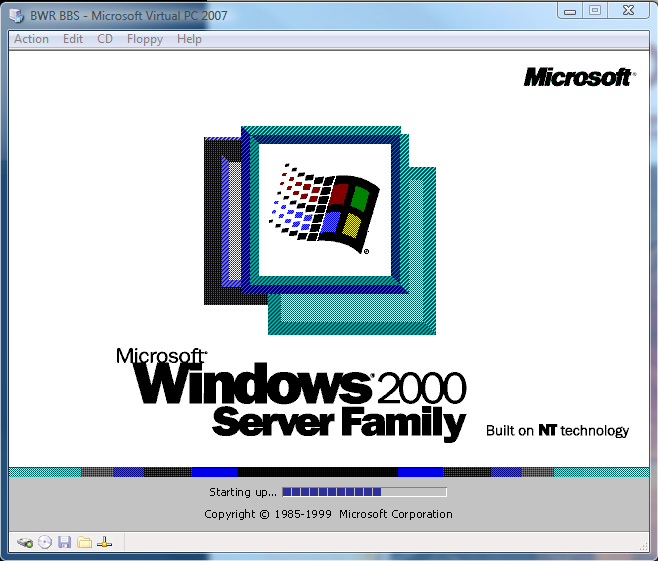 First welcome screen an ANSI Telnet user sees. Nearly identical to the one I used longest back in the 1990's. ANSI2HTML v1.0 output HTML from the BBS. ANSI2HTML was written by....ME! Most of my learning experience has indeed been at my full-time employment. I have made great strides in Visual Basic, particularly in the area of database interaction. I've been developing a database interface used for sorting, editing, and generating reports completely in Visual Basic 2008 and based on Microsoft's .NET 3.5 architecture. I would like to say that's been fun, but everytime I get it "completed", someone wants to add something or just keep spinning it into something it wasn't ever meant to do. Still, it does keep me sharp, though I feel it has detracted from the possibility of further improving other IT infrastructure. A very wide (dual-screen) screenshot of my development on the above mentioned VB 2008 Database project. Yes, I do get confused when dealing with this much information. Someday I'll learn to juggle it all...maybe.